Presented as the end all solution to blown drive belts and promising the most pure sport driving experience available, Yamaha introduced the YXZ a year and a half ago with the industry’s first manual transmission, shocking nearly everyone. The new box came with a host of promises, and plenty of speculation. More control, better durability, less power loss, and a real driver’s experience were all touted as reasons why the stick-shift was the sport SXS transmission of the future. Some of these turned out to be less true than others. Fast forward to now, when we’ve got plenty of experience with the highly anticipated Yamaha. They are surely fun, and the manual does add a dimension (as well as a degree of difficulty) to the driving experience compared to the CVT. The theorized efficiency improvements have however turned out to be negligible, and the manual has shown to considerably hinder low speed trail / mud performance (sending many to the aftermarket for gear reduction kits). In parallel, other manufacturers have been making strides in their clutch designs, improving performance and belt life. At the end of the day, it has become clear that the automatic CVT has its place and will probably dominate the SXS market for the foreseeable future. So why would a company like Yamaha, trying to break into the market, with a history of building some of the best powersport CVT systems out there, take such a risk? Why alienate those unable or unwilling to learn to drive a manual? Why make your first real sport SXS appeal to only certain segments of the sport? Why boast about the manual’s superiority only to almost immediately release another version with an auto clutch and paddle shifters? Did they really think it was that much better? What does the Rhino have to do with this you ask? Recall that the Rhino was the first SXS heavily used in a sport environment. While not marketed as a strictly sport oriented machine, it didn’t stop them from being driven like one. It didn’t stop rookie drivers from rolling them over and hurting themselves. And it didn’t stop those drivers from filing hundreds of lawsuits, amassing millions of dollars in settlements that kept Yamaha out of the sport SXS market for as long as they were. Of course they couldn’t ignore the demand forever though. So in addition to having buyers sign some papers at the dealer that a good lawyer can work around, how might you protect yourself from lawsuits in the future? How might you keep these highly inexperienced people out of the driver’s seat? Maybe put a stick shift in it? 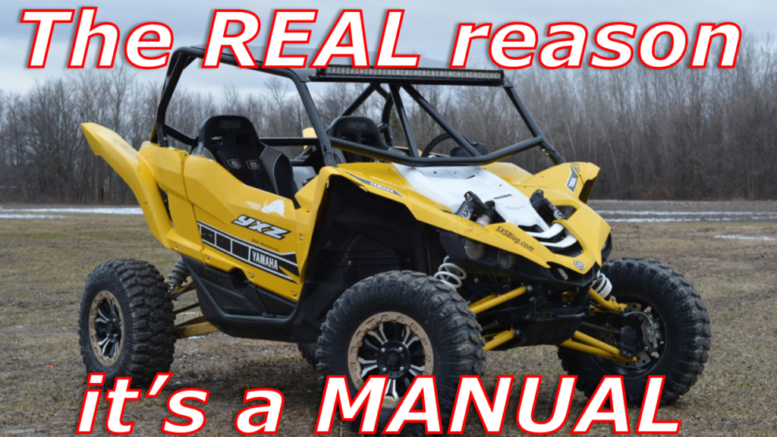 3 Comments on "Why Yamaha REALLY made the YXZ a manual…"
I believe that the overwhelming amount of YXZ fails on YouTube is an indicator that the manual shift was not a deterrent to the novice buyer. The only problem the Yxz really had was that people were burning the clutch up….Thats it…usually from over slipping it in situations that it was not intended for…It really didn’t fail…The clutch is strong…but it is a clutch..The machine will do most things as any other but not by lugging it through..or taking it to 10500rpm and unloading it…Its knowing the unit and what works and what dont…. Engineers can’t design out stupid operators.